Competition will be fierce for the title of Delaware State Chicken Wing Champion. The competition gets underway Saturday October 26, 2013 with over 25 contestants competing in 3 categories – Best Wings, Most Unusual Wings, and Best Wings Presentation. 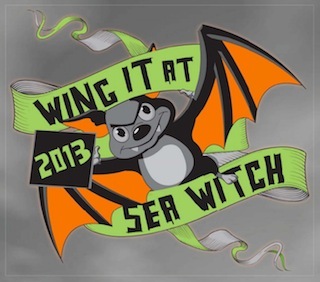 The chicken wing cook-off for State Champion will take place smack in the middle of the insanity and costumed silliness that is the 24th Annual Sea Witch Festival (a family oriented, slightly organized parade of costumes, floats and other Halloween shenanigans). That “Wing it at Sea Witch” slogan is a great, unintended tie-in to the Delaware State Chicken Wing Championship competition, is it not? Thank you Sea Witch um… witches! The Sea Witch parade – shenanigans I say! Wing sauce makers and local chefs (see below) will gather in front of The Ice Cream Store at 6 Rehoboth Ave, Rehoboth Beach, Delaware to impress a roster of judges that include local media personalities from radio, print, TV and internet, as well as local politicians. Scheduled to judge will be (among others) Patricia Talorico – News Journal, Andrew Koch – WGMD Radio 92.7, Mark “Petch” Petchey – WAFL Radio 97.7, Kelli Steele – WXDE 105.9, Rafael Orlando – WYUS 930am, Senator Ernie Lopez, Mayor Sam Cooper – Rehoboth Beach, Mayor Diane Hansen – Dewey Beach, Brian Keene – WBOC TV, Rehoboth Foodie – RehobothFoodie.com, Al “Buddah” Goldenberg – ILoveitSpicy.com, and Marilyn & Brian Meagher – HotSauceDaily.com. Dominic Pandolfino from The Starboard Restaurant, Dewey Beach. Chef Inton Mouynivong of Port Restaurant, Dewey Beach. Robert Parker of Wings to Go, Dewey Beach. Buffalo Wild Wings, Rehoboth. The Pond, Rehoboth. Zoggs Raw Bar & Grill, Rehoboth. Modern Mixture, Rehoboth. aMuse, Rehoboth. Arenas Deli & Bar, Rehoboth. Summer House Saloon, Rehoboth. Jakes Seafood House, Rehoboth. Casa Dileo, Rehoboth. Rigby’s Bar & Grill, Rehoboth. Dogfish Head, Rehoboth. Cafe Azafran, Rehoboth. Purple Parrot Restaurant & Bar, Rehoboth. Gretchen Hanson of Hobos Restaurant and Bar, Rehoboth. The competition will be open to all businesses that are current members of the Rehoboth Beach / Dewey Beach Chamber of Commerce. There is no fee to compete. Loan made super easy checkout our site. Prior winners include Beachcomber Restaurant, Wings to Go, Irish Eyes and Starboard Restaurant. 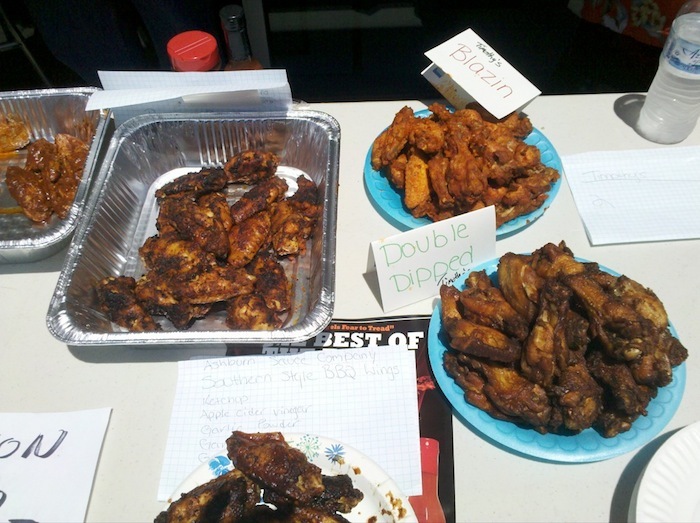 Judging for the Delaware State Wing Championships will begin promptly at 1:00 pm. Judges will be national and local food writers as well as TV, radio and newspaper personalities. The competition will be composed of three separate challenges. The winner of each challenge will be declared a Delaware State Champion and the overall winner will be crowned as THE overall Delaware State Champion. As each dish is handed in, all competitors will be required to turn in an 8½ by 11 inch paper, listing the name of every entry and its ingredients, so that the media can fully report on the fantastic tastes. Each challenger will also be asked to explain their entry in detail to the judges. Scoring will be on a thirty point system (where half points may also be used). A maximum of ten points for taste – a maximum of ten points for WOW factor – and a maximum of ten points for whatever the judge thinks points should be given (after all, there are no rules)! All entries may be displayed on whatever plates, dishes, bowls or other contrivances you wish to use. Please include a small sign with the name of your wings with the entry. Please pay attention, because you, yourself, need to retrieve whatever you use. You must turn in a minimum of 25 “portions” for each event. Any items that the judges don’t consume will be eaten (quickly) by the crowd! The more portions that you enter, the better chance you have of a judge loving their second taste. If you wish to include sauces, dips, rubs, garnishes or any flair with the dish, please do so. Because there will be so many entries, we would suggest that you attempt to be one of the first to turn in. Think of heat retention as well as the judges’ taste buds! Rules: there are none – the judges will have to answer the question, what, exactly, does the best wing taste like, look like, feel like and ?. We are looking for chef inspired wings that could grace the table of any restaurant! Rules: there are basically none. The Most Unusual entry can be based on taste, sauce, rub, cooking method or looks. It can be very visual and may be shown to the judges in any way. It can be anything that the chef things of! Rules: there are none – the judges must simply be amazed! Presentation ultimately means something visual or an impression that makes a judge want to reach out and eat the first wing. Any chef might want to re-enter a recipe from a previous category and to “jazz it up” somehow! All of the winners will be announced at the conclusion of the judging of all three categories. Announcements will be made at the Bandstand at the end of Rehoboth Avenue and the Boardwalk. Do you plan to attend the Delaware State Chicken Wing Championship next Saturday? If so, leave a Comment below, and stop and say “hi” at the judges table!